The last few years have been good to New Orleans, with lower unemployment than the rest of the U.S. and the focus on tourism resulting in jam-packed restaurants and hotels. But it hasn’t always been this way. What is really interesting is, how does the New Orleans’ economy compare to the rest of the U.S.? This article looks at the New Orleans economy and compares it to the U.S. economy and explains not only the driving forces the last few years but also goes back to the 1970’s to examine the big picture of how living in New Orleans is like an invisible tax that results in lower personal income growth than the rest of the U.S. Yesterday the Bureau of Economic Analysis released the estimates for personal income growth, which reflects the health of the economy because it measures the total income earned by U.S. residents. Snowden would be proud of the way personal income estimates include all compensation including self-employment, rental income, Social Security and Medicare and pension benefits. The statistics are released one month after the period it analyzes and there are two revisions in each of the following months. Yesterday’s release for June 2013 reported personal income was up 0.3%. This is the percent change from the preceding month. The bureau also releases the data in current dollars and chained dollars, but that’s another story. The reason you need to know the trend in personal income is because it is the driving force behind the consumer, and it is a growing percentage every time one of our industries moves overseas. The total economy is about 2/3 consumer driven and 1/3 industrial driven. In addition to knowing how the U.S. personal income is performing, it is important to know how the New Orleans personal income is doing. The government keeps track of that also. The more interesting information is, how does the personal income in New Orleans compare to the U.S.? The chart below shows the New Orleans personal income growth compared to the U.S.; the New Orleans Metropolitan Statistical Area is used because it is a standard way of measuring population and is used by the Census Bureau. There are 381 MSA’s in the U.S. 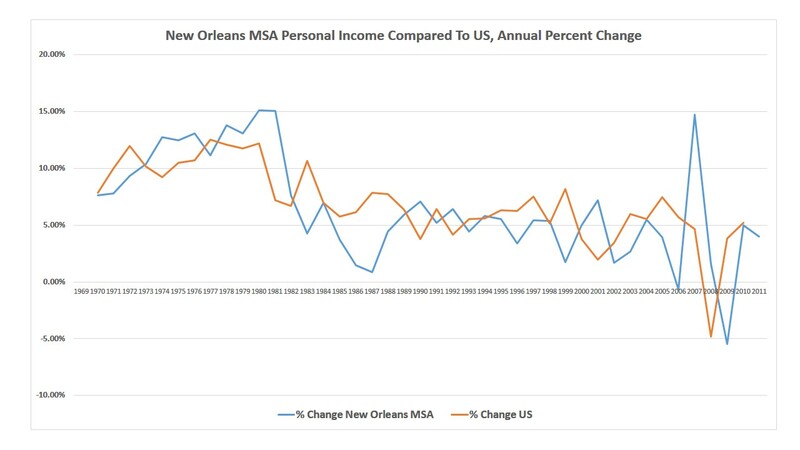 The blue line in the chart is the New Orleans MSA annual percent change in personal income and the first spike is 1981 when New Orleans annual personal income was 7.9% better than the US. That was the year Jimmy Carter was out and Ronald Reagan was in. MTV was born, the hostages were released from Iran, an OPEC agreed to sell oil at $32/ barrel. The largest decline in New Orleans personal income growth was in 1987 when personal income was 6.97% worse than the U.S.; Reagan was still president, Gary Hart and Jimmy Bakker stumbled, and oil prices fell by 50% but OPEC targeted oil at $18/barrel. The next counter-move was in 1999 when New Orleans personal income growth underperformed the U.S. by 6.47%, but in 2001 it reversed course and outperformed by 5.23%. The next big spike is after hurricane Katrina, when in 2007 New Orleans annual personal income growth outperformed the U.S. by 10.08%, followed by 6.39% in 2008. The chart below explains it better by looking at just the difference between the annual change in New Orleans personal income and U.S. personal income. Notice how many years the variance is above zero and how many years below. The numbers show personal income growth in New Orleans outperformed the U.S. in 17 of 41 periods since 1970, or 41% of the time. The cumulative difference in personal income growth is negative 17%. It’s better that we know what we have gotten into, but just don’t dwell on it. Frame it positively as a tax on living in New Orleans and the right to enjoy the culture and rich history of New Orleans. For the math oriented, the chart shows a formula of the trend line (dotted) of the data points in the blue line. The slope is negative and the coefficient is 0.0003. 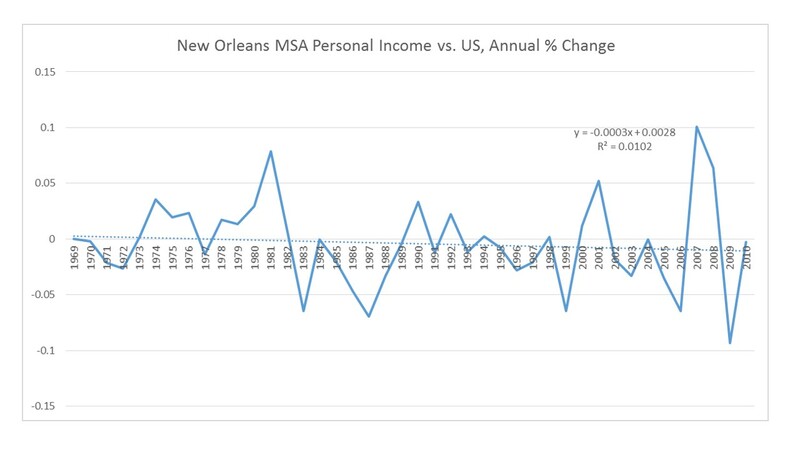 Using the past to predict the future means New Orleans personal income growth underperforms the U.S. by a factor of 0.0003. Annually.